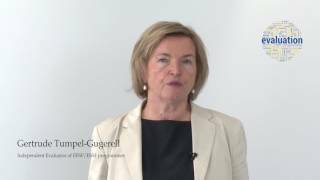 At the Annual Meeting of the ESM Board of Governors on 15 June 2017, the Independent Evaluator Gertrude Tumpel-Gugerell presented her Evaluation Report to the Governors. The evaluation focused on EFSF and ESM financial assistance programmes for Ireland, Portugal, Greece (EFSF), Spain and Cyprus. Chairman of the ESM Board of Governors Jeroen Dijsselbloem appointed former ECB Executive Board member Gertrude Tumpel-Gugerell as the Independent Evaluator in September 2016. The ESM Board of Governors will ensure that the report’s findings and recommendations are appropriately followed up to improve future programmes.